Nowadays when folks think G.I. Joe, they’re thinking about the characters and situations that have been around since the 1980s. They think about Snake Eyes, Duke, and Scarlett fighting Destro, the Baroness, and the hordes of Cobra. That all started while I was in college, with my mind more on girls than on cartoons. That’s just not in my mindset when it comes to the term ‘G.I. Joe,’ ’cause I’m old. My Joes were from a decade earlier and before, the action figures were double the size, and the action was less superheroic and more down to earth. I’ll be talking Retro Joe after the jump, see you there! I need to note up front that I never had any G.I. Joes myself. All of my knowledge and experience comes from friends, outside family, and that magical box called television. I wasn’t allowed to have dolls. Dolls were for girls. That’s just how it was in my house. You can talk all you want about action figures and how butch they were and they had guns and beards, etc. In my father’s eyes they were dolls, and therefore girls’ toys. Really, myself I didn’t see the Joes as any different from the smaller plastic army men, but my dad did. I did eventually get an Evel Knievel Stunt Cycle with the action figure included, but it was probably because I whined and cried constantly for it. My parents gave in, but I’m pretty sure my father was ashamed of me, no matter how many hours if joy it brought. You folks know I’m old, but just to give you a better framework, I’m closing in on fifty quicker than I want to admit. So my Saturday morning cartoon watching days were solidly between 1968 and 1978. The earlier part of that time was during the Vietnam War. It was at this time that G.I. Joe was going from being an actual G.I. To being just a doll, ahem, sorry, action figure called G.I. Joe. We knew all about Joe being military, but that was in the past. The main G.I. Joes were one from the Army, one from the Navy, and the Marines, and the Air Force. Rumor was there was even an Army Nurse. Even then as wee kids, we kinda knew war was not cool, and the Vietnam War was even less cool, so for the Joes to move on – that was cool. Thus the GI Joe Adventure Team was born. The G.I. 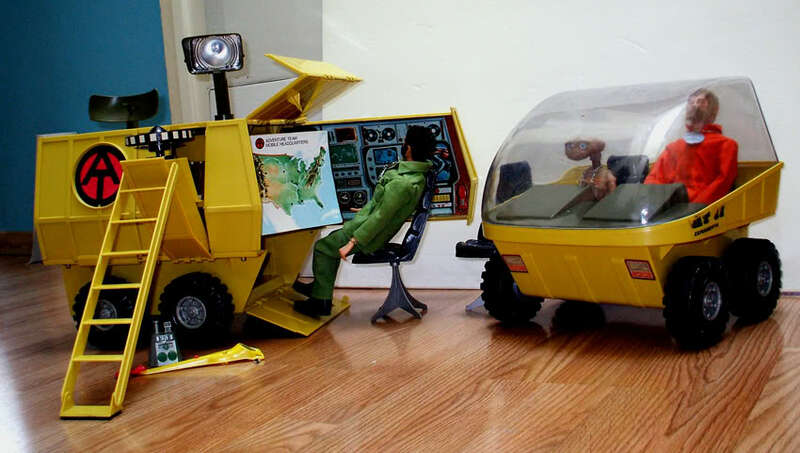 Joe Adventure Team was a new paradigm for the toy line. Hasbro found a way to give the action figure realistic hair, so why waste it? Joe got a beard and more on top than he’d had previously in the military, giving him a bit of a more mod look. 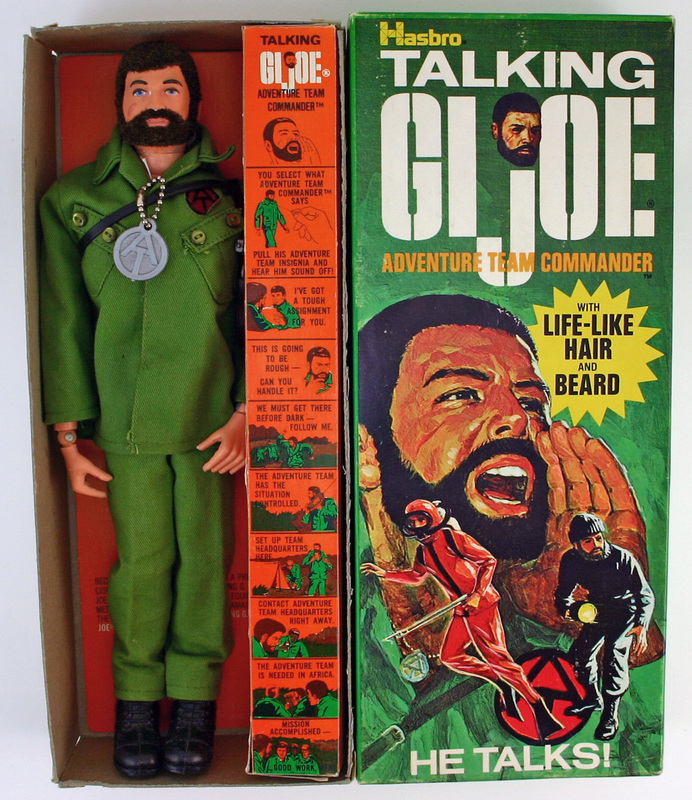 Integration came to toys faster than it did to comics and television as Hasbro introduced African-American versions of Joe, probably speeded ahead by the ‘fro-like new hair. Joe had a new look, and a new mission as well – exploration and adventure! Saturday mornings featured sometimes one to two minute and longer commercials featuring the adventures of Joe and his Team as they travelled to far off locales and explored hidden chambers, lost tombs, and dangerous situations. You could buy an ‘adventure set’ that would give you everything you needed for an adventure, even a cool title like “Devil of the Deep.” In one you could get a swampboat and an alligator, or a tomb and a mummy, or a radar truck and a lost satellite, and they even had vehicle sets like helicopters, ATVs, and the Mobile Support Vehicle. The action figure itself changed as well, and became more individual. There was the Action Team Commander who said prerecorded phrases, then the Man of Action, and the Air, Sea, and Land Adventurers, who all came in Caucasian or African-American. Then they added the beardless Astronaut who also talked, but in NASA jargon. The next innovation was the Kung Fu Grip, which at its simplest was stiff rubber clawed hands that could grasp items like ropes, ladder rungs, or even guns, knives, or giant condors. 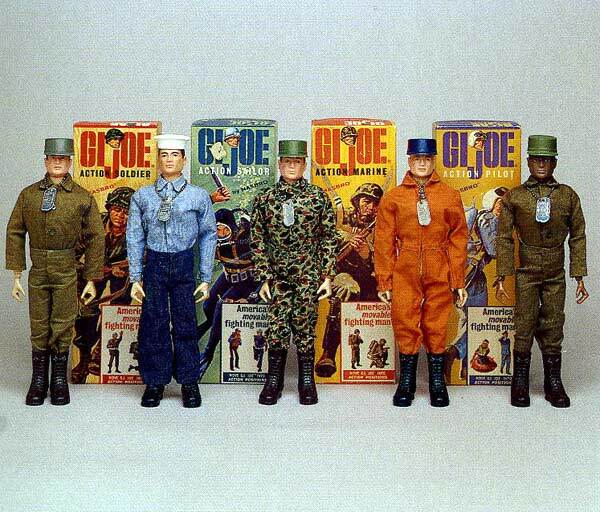 So cool, soon all the Joes came with the Kung Fu Grip. Then came Eagle Eye G.I. Joe, who had a hole in the back of his head with a magnifying glass in the eye in the front, the effect was that of looking through a telescope. Like all good things that succeed, it brings on competition. The biggest of these in the 1970s was Big Jim, who had a more superheroic tact to his team, the PACK, including Warpath, Dr. Steel, and The Whip. Add to this the wild success of the Six Million Dollar Man, as well as the Mego line of established comic book Super Heroes, and Joe just had to roll with the changes. The G.I. Joe Adventure Team became super-powered to compete with the competition. Eagle Eye G.I. Joe was joined by Mike Power, the Atomic Man, essentially a Steve Austin knock-off, and Bullet Man, who was, um, pretty much a rip off of the Fawcett Comics character of the same name with a different costume. I still wonder after all these years where DC Comics’ lawyers were when this was going on. Also, Joe gained enemies. There were the Intruders, brutish beast men ‘from another world,’ who had a ‘crusher grip,’ and Terron, a giant motorized ‘beast from beyond,’ among others just not worth mentioning. Hmmm… perhaps it’s a good thing the G.I. Joe line was given a rest shortly thereafter. When it reemerged in 1982, it was under the ‘Real American Hero’ banner featuring the characters that prevail today in toys, comics, animation, and film. Yo, Joe!